Valentines, Easter, Fireworks, Mothers' Day, Father's Day, Read more. How did we get Valentine’s Day? One legend has it that “Valentine” was a priest in 3rd Century Rome, ruled at that time by Emperor Claudius. Claudius decreed that young men were not allowed to marry, believing single men made tougher soldiers. It is said that “Valentine” performed marriages in secret, uniting hopeful couples in happy matrimony to live happily ever after. Unfortunately for Valentine, he was not have a “happily ever after” and instead was promptly executed for having such a soft heart. Cut to the 21st Century, where “Valentine’s Day” has come a long way from its tragic beginnings to represent a time to share our appreciation and affection with loved ones. Living in Vancouver, you could say we live in one of the most romantic seaside settings in the world, with spectacular scenery and moody weather, perfect for cuddling up with a loved one. 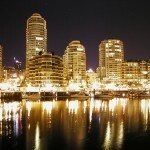 What better way to spend your Valentine’s Day then by joining us for a romantic cruise in the Vancouver Harbor? Impress your mate with a sumptuous dinner feast of Lemon Dill Salmon, Teriyaki Chicken, Roasted Potatoes, Seasonal Vegetables, Pasta, Salads and coffee and tea. Share a bottle of champagne while enjoying the lights of the Vancouver seashore and feed each other bits of our Velvet Cupcakes. Don’t forget to have your picture taken by our experienced staff-this will be a memorable keepsake for years to come. When you’ve had your fill, swing your partner to the dance floor and sway to the music under the stars. Give us a call to book your getaway on the water at 604-688-6625. December is the perfect time of year to make new memories with family and friends. It’s a time for giving thanks, sharing some laughs, and maybe even treating ourselves to a few extra goodies to combat the winter doldrums. There’s always the ever handy New Year’s Eve Resolution to make up for any over indulgences. It must have been a pretty dark month, until, one day, over 40 years ago, one little brightly lit boat illuminated the night. From that humble beginning, the Parade of Lights has grown to include over 50 boats with thousands of spectators enjoying the sparkling nights from December 3 to December 23rd. During this time, we will be running our Carol Ship Cruises here from Granville Island-another great spot to get your holiday shopping done and maybe even enjoy some roasted chestnuts while checking out some of the great buskers performing on the Island. Why not end your day relaxing on one of our Carol Ship Cruises with family and friends? Our Carol Ship Cruises include a Holiday Buffet with all the trimmings, including Tender Roasted Turkey and Honey Glazed Ham, so, no need to make dinner after your day of shopping. Our cruises are fun and interactive, so don’t be surprised if one of our cheeky Cruise Directors gets you to join in on the Carol Sing Along! From all of us at Accent Cruises-we wish you all the best during the Holiday Season and hope you’ll join us in December! The changing colors and cool crispness of the fall season are upon us. Time for hot toddies, cozy socks, and quiet intimate evenings spent with friends and family. A staff member of ours shared this delicious recipe with me, that I’d like to pass on to you. Bread pudding is one of my favorite treats, having had my first taste of it in New Orleans. I was instantly hooked to its comforting simplicity. Originally known as “poor man’s pudding” and created as a delicious way to recycle old bread, I love this recipe for its down to earth goodness. Somehow, it seems like the perfect Autumn dessert. I plan on making it this weekend. Happy Thanksgiving from all of us at Accent Cruises! -Bake at 350 degrees for 45 minutes – 1 hour. Insert toothpick into center of bread pudding to test when done. Scoop bread pudding into a bowl and top with whiskey sauce. Serve warm. Enjoy!!! Accent Cruises has successfully executed hundreds of corporate functions, weddings, and private family gatherings, throughout our over 22 years in business. Planning an event can be stressful for the organizer. Here some simple tips to ensure that your event planning with us is smooth and stress free. We are dedicated to providing you with a quote for your event that will suit your needs, so be sure to clear about what kind of budget you have to work with. For example, if you know that you have $50 a person for a dinner and 2 glasses of wine; let us know, so we can select a menu for your group that fits in your price range. This simple step will ensure you get an accurate, custom quote perfect for your pocketbook. When planning a party consider if you want to leave room in your budget for some decorations. Whether you have $50 to spend or $1500, even small touches can have a big impact. Helium balloons added to the entrance can give a welcoming festive touch, and at about $1.50 each at most dollar stores, are an inexpensive addition. Small bubble rocks or even shells at your local dollar store laid out along your tables can also provide extra ambience. Small gift boxes with a piece of chocolate inside placed at each setting, look and taste great. If you have a bit more to spend, ask us about renting chair covers , sashes, votives, even red carpet runners if you’re looking for that “Hollywood Red Carpet” feel. Again, let us know the budget you have for decorations and the theme you’re going for, and our creative team will be happy to steer you in the right direction. It’s a good idea to set up a time to view the yacht you are interested in. This will give you the best sense of spacing. It’s also a great time to meet with one of our sales and event coordinators who can answer any questions you might have. We love to meet with our guests. I once attended an event where a hapless guest with a peanut allergy was served brownies. Needless to say, he did not enjoy the evening. Now, this is an extreme example, but it is a good idea to email all your guests and ask them to inform you, the organizer extraordinaire, of any food allergies or special dietary restrictions. Then be sure to pass that information to us, so that we can ensure your guests have a wonderful, stress free dining experience, knowing their needs have been taken into consideration. Getting here is easy. We are located at the Ferry Dock on Granville Island in front of Bridges Restaurant. Click on the “Contact Us” link in the top left hand corner of our homepage to access our address and map. LADIES TIRED OF HOCKEY, SOCCER AND SPORTS EVENTS TAKE YOUR MAN ON A ROMANTIC SUNSET DINER CRUISE! As a VIP client your 3 hour FIREWORKS Dinner Cruise is being offered at $25.00 off the regular $99.95 on weekends now for $75.00 per person. Wednesday night FIREWORKS Dinner Cruise $64.95 per person. RESERVE YOUR TABLE RIGHT NOW, FIRST COME FIRST SERVE!! Planning a birth party or an anniversary party? $25.00 week days or $30.00 weekends minimum group size applies (party & dance cruise only). 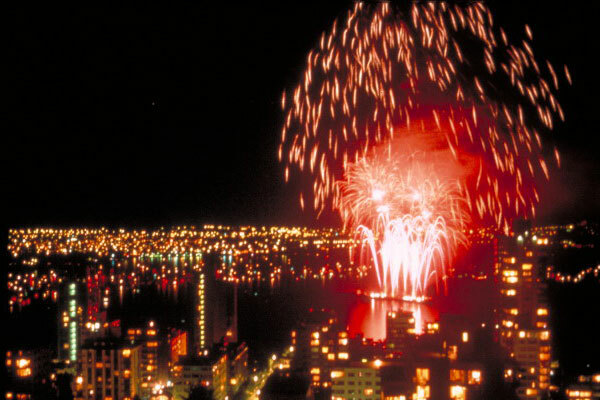 The fireworks are on in English Bay! Every year the single most attended celebration for Vancouverites! A sell-out for every Restaurant with a water view, including us!! Book early to avoid disappointment. Join us Jul 21st, 24th, 28th, or 31st for our dinner cruise and have a front row seat! July 21 = USA, July 24 = Spain, July 28 = Mexico, July 31 = China and finale. Departing/Returning to Granville Island…you miss all the downtown traffic and street closures! The well awaited 2010 has arrived in the City and it’s buzzing with exciting tents to finishing Olympic sites and now it is time to relax and enjoy ? How can you enjoy and relax when you have no idea where to start? Accent Cruises will put on our blog on a weekly basis: where to be in Vancouver… we will list the most interesting venues and what they are offering. As you might know every country participating in the Olympics has there own venue where we can learn about there cultures. Come and join Accent Cruises on the water for breathtaking views and good food!